Beautiful brick front 5 bedroom 3 full bath ”Sapphire” model in desirable Northern Manalapan. Spacious foyer and hardwood floors throughout. Sunlit kitchen features white Brookhaven cabinets, center island, extended breakfast room with french doors leading to wood deck and wooded backyard. Adjacent family room with wood burning fireplace and brick surround. Office/bedroom on the 1st floor with full bath. Master bathroom includes double sinks, jacuzzi tub and stall shower. Decorative molding, recessed lighting, brand new roof, side entry garage. Close to shopping and NYC transportation. Just waiting for the next family to enjoy! NEW PRICE on this beautiful 4 bedroom 2 1/2 bath colonial in desirable Orchards at Aberdeen. Freshly painted, decorative molding, gorgeous brazilian cherry hardwood floors. Kitchen includes granite counter tops, tumbled marble backsplash & s/s appliances. Family room showcases wood burning fireplace w/marble & wood surround. Remodeled bathrooms. Finished basement with open floor plan & high ceilings. Oversized wood deck, gorgeous vinyl fence with totally privacy. Professionally landscaped, under ground sprinklers. Great Matawan schools. Close to NYC transportation, shopping, Cheesequake State Park and GS Pkwy. Just waiting for the next family to enjoy! Open House Sunday, April 22 from 1 – 4! Hope to see you there! Great curb appeal! Beautiful brick front 5 bedroom 3 1/2 bath colonial in desirable ”Charter Club” in the Morganville section of Marlboro Township. Hardwood flrs in the formal L/R & D/R. Kitchen features 42” cabinets, CI w/granite counter tops, S/S appliances & tumbled marble back splash. Downstairs bedroom is converted into a home office w/custom built ins. Family room includes wood burning F/P & wet bar. Master bedroom suite features vaulted ceiling, 2 WIC & updated master bath w/jetted tub, shower w/frameless shower door, double vanity w/granite counter tops. Spacious bedrooms upstairs. Full finished basement, high ceilings, TV area, playroom & full bath. Wood deck leads to country club backyard, Anthony & Sylvan heated in ground pool & Jerith fence. New roof. 2 car side entry garage. Picture Perfect! 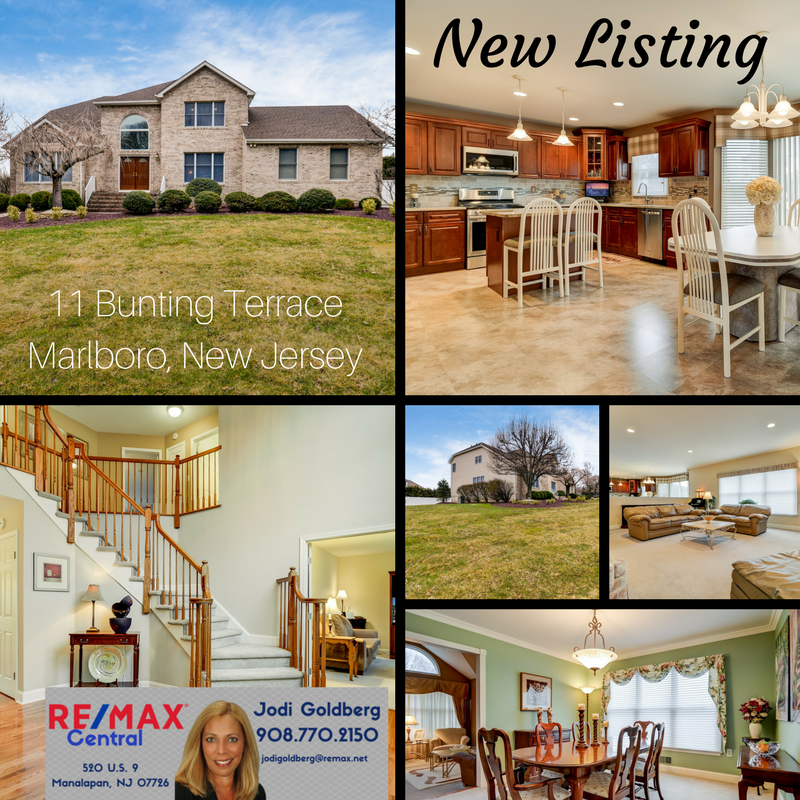 Gorgeous 5 bedroom 3 full bath brick front colonial in desirable ”Highland Crest” located in the Morganville section of Marlboro Township. Grand two story foyer, 9’ceilings on the 1st floor. Kitchen and all baths remodeled in the last yr. Custom kitchen includes center island, granite counter top, stainless steel appliances & tumbled marble back splash with glass tile. Adjacent sunken family room showcases wood burning fireplace with marble surround. Bedroom/study & incredible full bath on the 1st floor. Step down living room features a vaulted ceiling. Decorative molding. Brand new spa like master bath, marble, frame less shower door, double sinks, over sized ceramic tile. Main bath includes quartzite counter tops & custom vanity. Brick paver patio. Wood deck. 2 car side entry garage. Custom brick front colonial in desirable Marlboro Woods North. Huge sunken living room with recessed lighting & wall to wall carpet. Adjacent built in wet bar. Kitchen features center island, granite counter tops, metalic back splash, under mount lighting, lots of counter space & large breakfast area. Great room showcases gas fireplace with stone surround. Bedroom with full bath on the 1st floor. Master bedroom includes dressing room suite with desk & wall to wall closet. Updated bath with farm house sink & floor to ceiling tile. Hardwood floors throughout. Full finished walk out basement. Incredible private country club backyard with in ground heated gunite pool, waterfall & slate patio. Multi tiered deck with hot tub. Perfect for entertaining. 3 car side entry garage. Cul de sac location in desirable ”Marlboro Manse”. This 5 bedroom 4.5 Bath Emerson model features a grand two story foyer & 9′ ceilings on the 1st floor. Custom European kitchen with granite counter tops, Murano Italian glass back splash, all top of the line Miele stainless steel appliances, butlers pantry with espresso bar & wine cooler. Bedroom and full bath + powder room on the 1st floor. Family room showcases wood burning fireplace with marble surround. Hardwood floors throughout Spacious master bedroom, huge sitting room & 2 WIC. Full finished basement includes full bath, steam room, rec room & gym. Oversized trex deck and plenty of room to play. 2 car side entry garage.